It was a starburst seen from coast to coast on Wednesday night's edition of The Tonight Show Starring Jimmy Fallon. 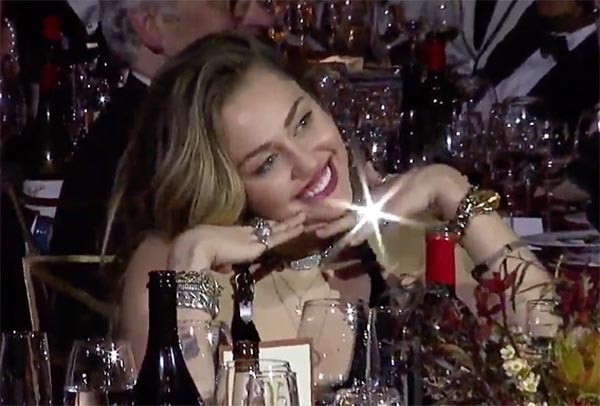 The burst emanating from Miley Cyrus' new wedding ring was so big and so bright that new spouse Liam Hemsworth joked that the visual effect might have been a product of CGI (computer-generated imagery). Acclaimed Australian actor Hemsworth, 29, and pop star Cyrus, 26, tied the knot in a low-key ceremony at their home in Franklin, Tenn., in December. And when Hemsworth was awarded the G'Day USA Excellence in Film award in Los Angeles on January 26, the actor was sure to thank his new bride. "Thank you to my beautiful wife," he said during his acceptance speech. "You're a sweet, sweet angel." On Wednesday night, Cyrus' ring and the giant burst were the subjects of a fun exchange between Hemsworth and Fallon on The Tonight Show. "People love you and Miley together," Fallon said, "but I saw a clip of you from the G'Day USA Awards." "When I was on the stage and I referred to her as my wife?" Hemsworth acknowledged. "Yeah, people liked that. Big, big cheer." "She was kind of heckling you from the crowd," said Fallon. Hemsworth explained, "Yeah, I started saying nice things about her and then she wanted more, obviously. I said, 'I'll tell you when I get home.'" "There was this one picture as they were cutting to her where [there was] this bling from her ring. And I was like, 'What kind of rock did you get her, man? Holy moly.'" "There are a few different rocks on there, not to brag," said Hemsworth, "but there [are] a couple of different ones." "Well done, buddy," Fallon said. "Oh my." "I thought it was CGI when I first saw that," Hemsworth joked. "I was convinced it was CGI because if did a full-on b-i-i-i-i-n-g."
"It was a real b-o-o-i-n-g," Fallon said, trying to imitate Hemsworth's take on what a starburst sounds like. "Just perfect," Fallon said. "I was like, 'Well, maybe she has magical powers, too. And she was zapping something from her ring to you.'" "Yes, she's brainwashed me," Hemsworth concluded.